Today I want to talk about a topic that is very close to my heart. Long ago in a far more civilized time, before twitter feeds and the blogosphere, yes before cellphones and even the internet, people were happy to do things slowly. And when these fine people needed to locomote their favored form of transport was the Airship. 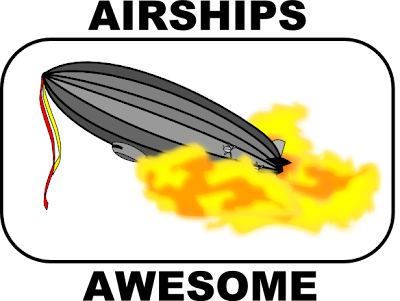 Airships, also known as Zeppelins or Dirigibles (From the French "diriger" to direct plus -ible, meaning "directable" or steerable) once ruled the skies. These graceful giants floated across and between continents, ferrying the most important people to there most important business with a level of luxuriating comfort unseen in modern air travel. At their height the transatlantic route between Germany and Brazil took a leisurely 68 hours, much like a weekend in a luxury hotel. Sadly, despite the elegance of these mighty beasts, the unquenchable desire of man for speed and stress coupled with the Armageddon of the world wars led to their eventual retirement from use. But I feel this is a tragedy. How can we have discarded the fair Dirigibles for such filthy a replacement as the jumbo jet? In light of this, and in the same spirit as the conservation of the Panda Bear, I propose to start a political party with the sole and express purpose of bringing back the Airship. It is my firm belief that this step will start us on an unstoppable road to a more civilized and sophisticated society. Please join me, by spreading the virtues of airships, and remember: Airships! Awesome!